It’s no secret that a diverse workplace can drive a company’s success by fostering a competitive and innovative edge. In fact, more diverse teams directly correlate with more profitability. In order to open your company up to a broader talent pool and remove barriers in the work environment, it’s imperative to ensure that your workplace is accessible to people of all abilities. A disability — either physical or mental, from birth or developed later in life — should not be a limiting factor in your recruiting, hiring, or retention strategy. The Americans with Disabilities Act was passed in 1990, yet a 2017 report found only about 28% of companies have hiring goals around people with disabilities. 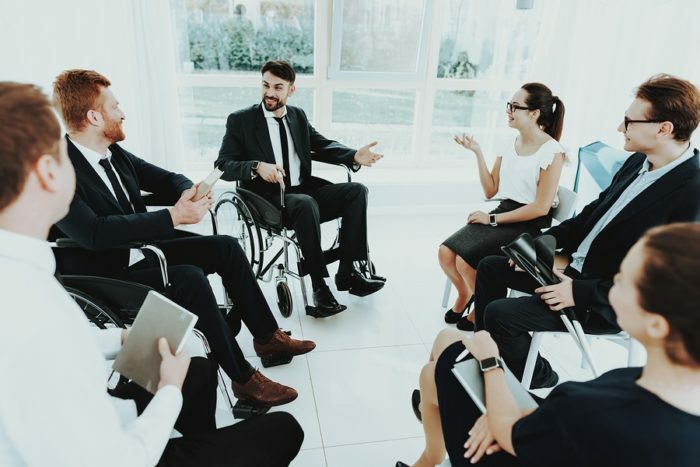 Creating an accommodating, diverse workplace that includes people with disabilities leads to many measurable benefits, such as increased innovation, competitive advantage and greater cultural awareness. Unless employers recognize that diversity and inclusion goes beyond race and gender, they aren’t likely to make an effort to hire people with disabilities. But for those who do, merely recruiting these workers isn’t enough. Besides adopting policies that promote an inclusive culture, making your office space accessible and accommodating is equally important and the upside goes far beyond compliance. Making changes to the accessibility of your office can seem daunting, which is why we’ve compiled the most essential steps to take and tips on how to sustain them. Implementing many small changes can make a big difference in the accessibility of your workplace and the effectiveness of the people you hire who have disabilties. Keep in mind that changes you make to your physical office space need to comply with laws vary by industry and state, so it’s best to cross-reference with local resources. Reviewing the ADA laws and regulations is a necessary place to start in improving the accessibility of your workplace. Being familiar with the government guidelines will help you identify the areas in which your workplace is currently lacking, and helps protect you from potential violations. The ADA stipulates that employers must treat each employee with a disability on an individual basis, with the goal of equal opportunity in mind. The ADA is clear when it comes to prohibiting discrimination based on a disability. The ADA also expressly states that, unless it poses an undue hardship, the employer must provide reasonable accommodations to qualified employees with disabilities. Essential vs. marginal job functions — When it comes to essential job functions, employers may expect employees with disabilities to meet the same standards of production and performance as other employees, but who may require a reasonable accommodation to do the job. However, the inability to perform a marginal job function cannot be a reason to refuse to hire a person with a disability or to discipline them. Employers should therefore determine what are job essentials, and which are not. The EEOC offers detailed guidance on the differences in its Technical Assistance Manual. If an accommodation is needed — Employers cannot evaluate employees on their ability to complete the job function without the prescribed accommodation. An employee with disabilities cannot have their job terminated or be demoted if the employer does not attempt to provide reasonable accommodation unless it would impose an undue hardship on the business. Equal opportunity: Reasonable accommodation must be provided in the job application process to enable a qualified applicant to have an equal opportunity to be considered for a job, to enable a qualified applicant to perform the essential functions of the job, and to enable a qualified employee with a disability to perform the essential functions of a job currently held. Compensation — An employer cannot decrease the compensation for the role either because marginal tasks were removed from the job responsibilities or because a reasonable accommodation was provided. However, changes in salary due to regular practices — such as if an employee transitions to a lower paying or part-time job — apply the same to employees with and without disabilities. Expressing commitment to a diverse workplace welcoming of the skills and talents of people with disabilities, both internally and externally, is one of the easiest ways to foster a disability-inclusive culture. Examples include equal opportunity statements that specifically mention disability on company websites, statements by top company leaders, advertisements featuring people with disabilities, articles in employee newsletters about disability-related issues and more. If this is the first time your company is being truly intentional about creating an accessibility-friendly work environment, there may be significant changes involved in updating your company policies. Pay specific attention to policies regarding workplace discrimination policies, and ensure that specific language for employees with disabilities is present. Unconscious (and even conscious) bias often grows out of misunderstanding, which is why comprehensive training is key. Ultimately, you want to increase awareness throughout the team so that everyone feels comfortable and confident in day-to-day interactions as well as during interviews, managing staff, and reporting to higher-ups. An introduction to the company’s new commitment and policies. You may also consider designing team trainings around the specific disability of an employee. For example, offering basic American Sign Language (ASL) training for coworkers when a deaf employee is part of the team. While most training should include the entire team, it’s also important to provide leadership training for managers and supervisors. Developing effective and engaging communication styles should be at the core of these trainings. Seeking expert guidance in revising your company policies and crafting educational materials can help make the process easier to navigate, as well as enable your company to offer better support for fully integrating employees with disabilities. Along with making the actual office space accessible, three other areas deserve equal consideration: the equipment an employee needs, the company culture, and the company website. Let’s go over the details you need to know. The best way to make sure you don’t miss anything when redesigning your office to be ADA-compliant is to hire a professional, ideally one familiar with Universal Design principles. Universal design creates an environment that can be used in the widest possible range of situations without any need for adaptation. While certain changes may seem obvious, like adding a ramp for an employee who uses a wheelchair, there may be smaller accommodations that escape your eye. A professional can assess your environment and recommend changes that can create a more accommodating office for everyone, helping you invest wisely. Creating a layout that is easy to maneuver for all employees, which may include wayfinding tools as well as removing objects that might create obstacles. Widening doorways and adjusting the weights of doors that don’t open automatically. Ensuring that all wall lighting fixtures are no more than 4” from the wall and affixed between 2’4” and 6’8” above the floor. Providing ramps at all entrances and within the office where needed. Assigning accessibility-friendly parking spots where applicable. This is not a conclusive list, and the specific actions to take will vary by company and employees, but it should give you a solid foundation to start making changes. Start with the immediate workspace, including adjustable desks and chairs, monitors, phones, keyboards, and headsets. Consider common spaces. Tables and chairs in the conference room or kitchen, for instance, should be able to accommodate all employees with disabilities. The employer doesn’t have to pay for personal-use items, but may need to supply assistive technology such as voice recognition software, ergonomic or color-coded keyboards, screen reader software, and even mobile apps designed to support specific disabilities. Offer social events for the team in which everyone can participate. One particularly effective resource is to create and encourage the growth of Employee Resource Groups. These are affinity groups that provide support for individuals with similar interests. If service animals are part of your accommodation, explain their role and educate workers on how to interact – or not – with them. An easy feature to neglect, having an accessible website is crucial to your efforts to attract a diverse hiring pool. When your website isn’t fully accessible to job seekers with disabilities, you could be missing out on great talent. The W3 Consortium released its Web Content Accessibility Guidelines last year. It’s a technical document intended for design professionals. SHRM published a simplified series of tips that include recommendations for colors and captions for videos, compatibility with screen readers, and keyboard accessibility. If your website is difficult or impossible for certain disabilities to navigate, it creates a barrier between your company and potential hires. Additionally, the website — as well as other company communication materials — is often a future hire’s first glimpse into the company culture. Making an effort to be inclusive at the starting point of an applicant’s process will help bring desired candidates right to your door. The best way to confirm your employee’s exact needs to perform at their full potential is to ask. Once a candidate has been offered a position, initiate a conversation to establish their specific needs and make an informed plan for providing the proper reasonable accommodations. In this conversation, make it clear that you value open communication and visibility. Many people with disabilities have experienced discrimination and negative work experiences in the past, and may not feel entirely comfortable being honest about their needs. Be straightforward in that you want to support them in performing to their fullest potential and you are committed to providing the accommodations to make that happen. This will also open up a safe space for the employee to share issues that may have arisen in the past which your company has yet to anticipate. In the case of less visible disabilities, it may not be clear what the individual’s needs are, which is where a safe conversation can prove most useful.